Interesting to listen that Merc this year have a loud wastegate sound. Last year and the years before I didn't hear any kind of wastegate sound from the Merc engines. So a bit more clarification: the changes were made to ensure safety (it could have lead to punctures at contact). So it did not directly crossed any ruling, just not deemed safe. 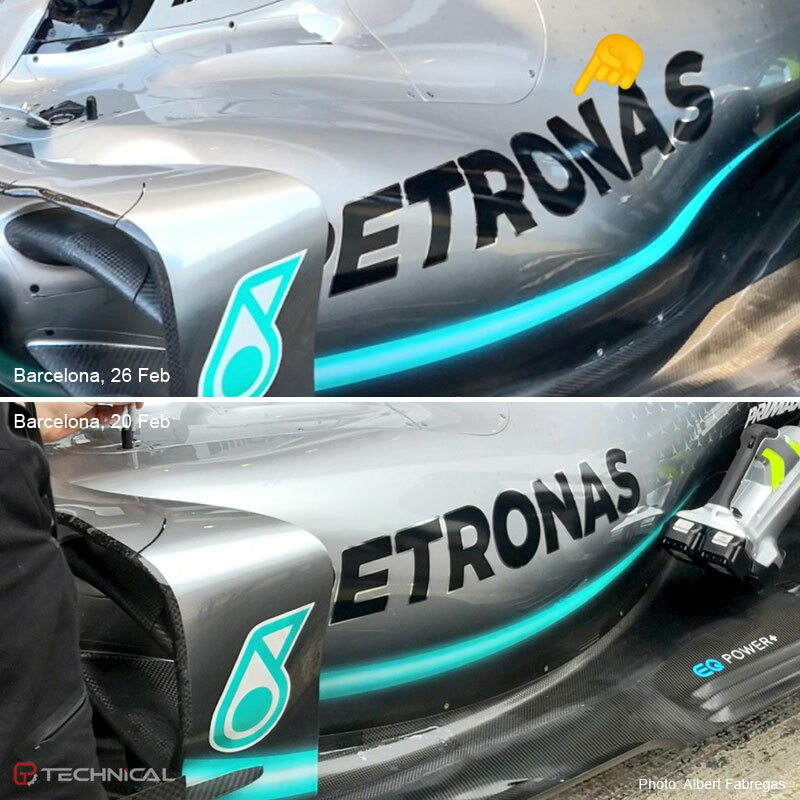 To be Frank I'm pretty sure any contact with a front wing endplate at that spot will usually result in punctures regardless. Not necessarily. The endplate has a minimum thickness of 10mm and 5mm radii on all extremities, including at its rear. Of course punctures are always possible once the carbon fibre crumbles on contact and creates sharp edges. Now that makes sense. The "seeing the flap" idea was a bit odd. Just a little kink to the endplate to comply with the rules, very clever. For aero purposes it's still exposed and pushes the air out. I'm thinking Mercedes already saw that ruling coming. I mean even Red Bull with time to think about it decided to close everything, they can't have come out with that on friday, right? The intent is obviously to create a vortex for the outwash flow around the tyre. 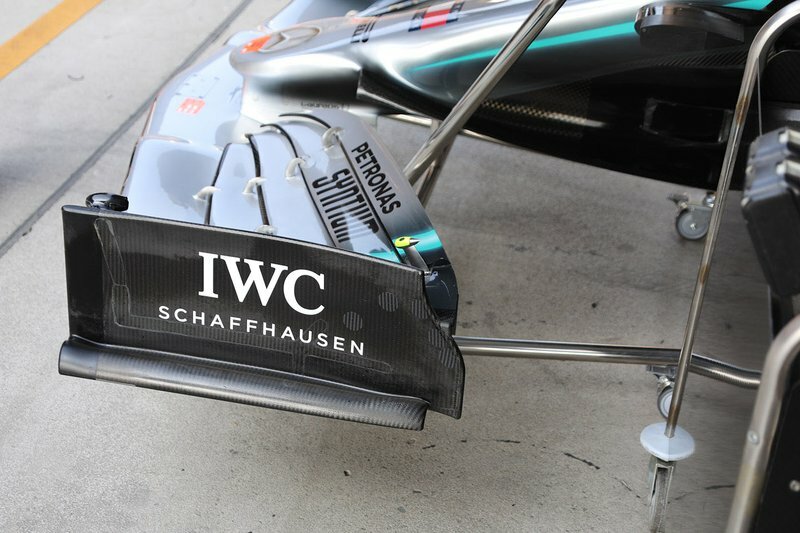 A wing element with sharp edges would have been very suited for that. What they had to do now will limit that intent. They might have seen it coming it would not be allowed, but maybe not at the time when the wing was already in production. In that case if they came to the realisation when they already had fully or partly produced the wing, they might have thought to bring it along anyway and see if they perhaps could strike lucky against expectations. They did however made the changes on site. Infact the change isn't that large. You have to know they bring equipment along to repair or even assemble parts in any case. The change they made isn't that difficult. The true problem lies in prediction what it does. They will have educated guesses, they will have data, but they might not have had the time to properly cfd it and run it through the windtunnel. The bargeboard area though, astonishing. 1) I have seen this alluded to on several occasions from various sources, but now that I've it from AMuS as well, I felt it was worthy of sharing: Mercedes has been dealing with cooling issues all season. Accordingly, Merc only run their engine at full power for about 2 laps per weekend (which they save for Q3). Wolff: "Ferrari can use higher performance levels in the training sessions than we can. This has to do with the calibration of the engine." 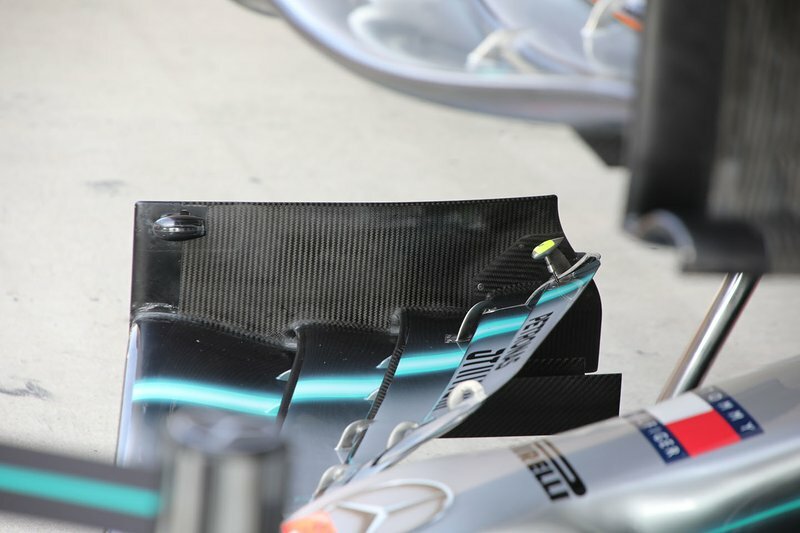 2) Mercedes seem to be making progress on the cooling issues, as they took a bit of a step forward this weekend. Helmut Marko: "They were 0.5s faster in S3 than us. That has something to do with sheer power from accelerating. They must have found something on the engine side again." However, the cooling issues aren't expected to be fully resolved until Barcelona. Last edited by zibby43 on Sun Apr 14, 2019 11:10 pm, edited 2 times in total. It's not really a kink. That little piece that was added on is supposed to be a part of the end plate now. So in effect the wing flap would fall behind it when viewed from the side. So it is practically the smallest possible extension of the end flap to appease the rules. I was replaying the race with FX sound, and one thing that is very interesting for me. Why Merc is that much louder than every other car? Does anyone can give me an explanation about this? If it’s the onboard videos the microphones are placed by the teams, so you are not necessarily hearing the sound from the same location on the car. If it’s the trackside sound, then I don’t know. Not onboard. Race but without commentary. A kink would in the wing element itself would have been illegal infact. The extension to the endplate has to be part of the original VES itself, and adhire to the minimum/maximum (10mm minimum, 12mm maximum) thickness and edge radii (5mm radius). It looks like it does so. This is a good example of how to explain the regulations, so I will remember this one (and I might even do an article on it). I do wonder if they can push it more to the edge. 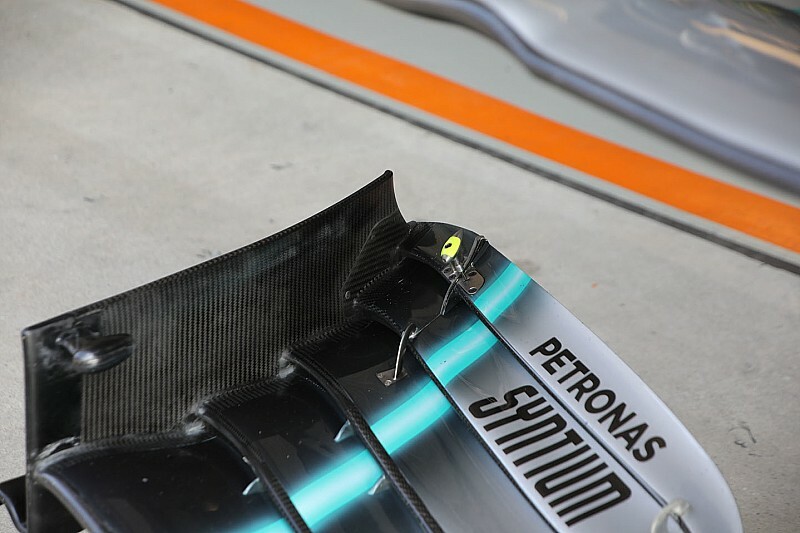 Since the solution got outlawed on safety issues, I wonder if they can get the wing element exposed without sharp edges.